Another tells me it is an old County Mayo song – very long – with a pretty tune. It is evidently a folk song. I hope to hear more about it. – Brooklyn, Sept. 19. Three other letters gave the same quotes with minor lyric variations. If some woman don’t kill me then I’ll live till I die. And beggin’ that’s too low. A fragment of ‘The Coo-Coo Bird’ was added to an Irish street ballad named ‘The Streets of Bunclody.’ That incorporated fragment originated in a common nursery rhyme of the British Isles. ‘The Streams of Bunclody’ was an old Irish street ballad recorded in the 1888 book Irish Minstrelsy; being a selection of Irish Songs, Lyrics and Ballads, London: Walter Scott, 24 Warwick Lane, Paternoster Row. And all I’d require is one kiss from you, sweet. ’Tis there I would have a sweetheart, but here I have none. And it never cries cuckoo till the summer is near. That lived by Bunclody, but now must remove. When I think upon Bunclody, I’m ready for to die! In October 1778 the famed Mrs. Jordan started “the fashion of singing ‘The Cuckoo Song’ in London theatres. The visiting American actress Fanny Davenport chimed in, followed by Mrs. Kendal. 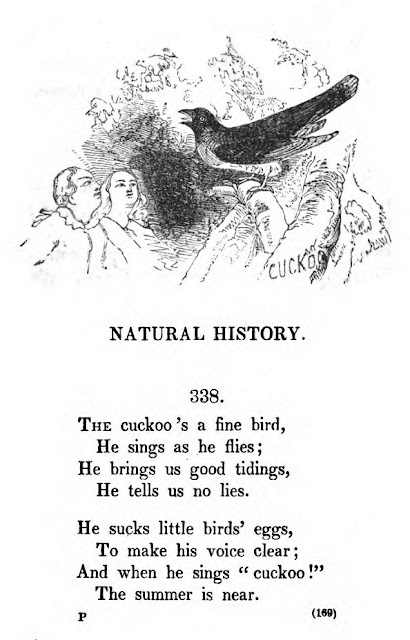 ‘The Cuckoo Song’ as sung by Mrs. Jordan, without the accompaniment of music, was beautiful beyond description.” The author of the song was William Shakespeare, the song; ‘When daisies pied’ from Love’s Labour’s Lost. The cuckoo’s song as a harbinger of the coming summer dates from ancient times. Sumer is icumen in/Lhude synge cucu dates back to the mid-thirteenth century (see HERE). Virginian Kelly Harrell, one of Jimmie Rodgers’ influences, recorded ‘The Cuckoo is a Fine Bird’ on June 10, 1926 in New York City (nos. 21 and 22 HERE). It's a sad song with mechanical cuckoo effects and fiddle. Harrell was a fine singer who probably had more influence on later country music than he has been given credit for. These lyrics were similar to those of a very popular and oft recorded song about a racehorse called ‘Old Stewball.’ the song was recorded by Joan Baez, The Hollies, and Peter, Paul and Mary. *The Cuckoo by Tom Rush can be heard on ‘Tom Rush,’ Elektra, 1965, or ‘Classic Rush,’ Wounded Bird Records, 2009. Online the song is HERE. 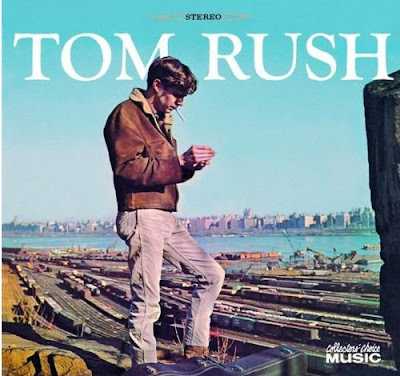 Tom Rush’s album was one of the best of 1965 along with Bob Dylan’s ‘Bringing it All Back Home’ and ‘Highway 61 Revisited.’ Irish bluesman Rory Gallagher romps through the song HERE. Janis Joplin encounters The Cuckoo on a trip HERE. A beautiful version by Cor Mulder is HERE. Peter, Paul and Mary HERE. Sound of the Cuckoo in nature HERE. I love The Cuckoo Song! A great old classic. We used to sing a version of it in school in.. Bunclody!